The Ashworth/Harris group with Elizabeth Shrimpton at the centre. I’m very lucky that so many photos of my relatives have survived. 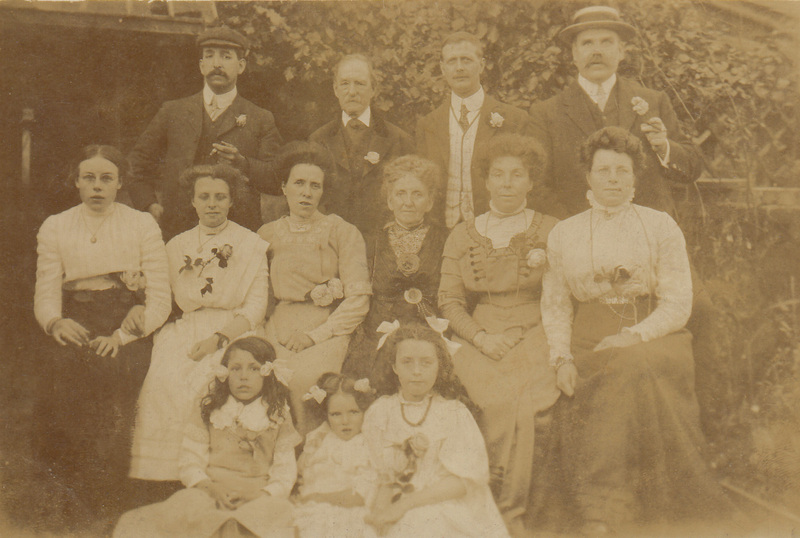 The above is one of my favourites – a family group – and I have been trying for some time to identify all the sitters. On the back row on the left, we have my great-grandfather, John Henry Nunn (1862-1936). On the middle row, third from the left, we have John’s wife – my great-grandmother Frances Louise, née Ashworth (1876-1961). 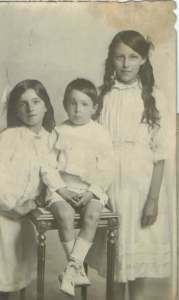 The older lady sitting on Frances’ left was identified by my grandad’s cousin Dorothy (1912-2011) as Elizabeth, née Shrimpton (1840-1915). Dorothy remembered Elizabeth (her grandmother) as an elderly, bedridden lady, who didn’t seem to mind her young grandchildren romping about on her bed.1)Dorothy was remembering something that happened to her as a toddler, which might make people scoff, but I have oddly vivid memories from that age myself – snapshots of being at playgroup before I started school, and of my brother’s birth when I was three. Elizabeth was the mother of nine children, and grandmother to many more. Her life story is quite interesting – it turns out that she was never actually married to her second husband, James Thomas Ashworth (1849-1890), and as a teenager, she hung about in a London park with an uncle, a soldier invalided out of the Army during the Crimean War. She was illegitimate and it seems that she moved from Chesham in Buckinghamshire (where she was washed under the pump every morning in the yard outside their cottage, even in the middle of winter) to London with her aunts. But aside from that – I wanted to see if I could date the above photograph (which might help me identify the people in it), and so analysed it for possible clues. An obvious place to start is fashion. We’re not looking at people in 1920s clothes, clearly, although my great-grandfather appears to be auditioning for Peaky Blinders. We might be able to assume that it’s around, or before, the time of The Great War – the corsetry worn by some of the women in the middle row seems quite stiff, although of course they might be wearing their “Sunday best” for the photo, not things they would necessarily wear every day. But the high necks on the women’s blouses (look at the two women on the middle row, on the right) suggest an earlier period, as do the buttons and trims on their dresses. The velvet collar on the jacket of the man standing second on the left of the back row came back into vogue in the 1950s and 1960s and was known as “Edwardian”, precisely because it was popular during the reign of Edward VII – between 1901-1910. So this might take the photo back into the first decade of the twentieth century, but older people often don’t dress in the height of fashion, and he may have thought his natty velvet collar was worth digging out for a celebration.2)He’s an older man, and it’s tempting to say that he’s Elizabeth’s husband – however, her second husband died in 1890. He is likely to be the husband of one of Elizabeth’s daughters, who are to be found sitting in the middle row, or he could be a father-in-law – perhaps the father of one of the other men in the back row, and a contemporary of Elizabeth’s. And continuing with collars – the high collars on the men’s shirts all indicate a pre-1920s date. We’ve got a rough time period for the photo now – let’s say 1901-1918. But we can be more precise when we identify sitters and estimate their ages. Now, we know that the older lady in the middle is Elizabeth, née Shrimpton, and as she died in 1915, our time period shrinks down a bit more – we’re now somewhere between 1901-1915. Children’s ages are easier to estimate than adults’, so I decided to identify the three little girls sitting along the front. My great-aunts, Lily3)Her first name was actually Doris, although I always knew her as Auntie Lily. It was only when I visited the family grave in Southend that I saw “Doris L. Smith” on the stone, and realised that I had never known her real name while she was alive. and Winnie, were born in 1904 and 1908 respectively, so it’s quite possible that two of the girls at the front of the photo are them. The photo below shows Lily and Winnie with their brother (my grandad), who was born in 1912. He looks like he’s about three in this photograph, placing it at about 1915. I think there’s enough similarity between Lily (even down to Lily’s wavy hair) and Winnie in the trio studio photo below to enable us to identify, in the group photo above, Lily on the front row on the left, and Winnie in the middle of the row. This means we can get nearer to the date of the group photo – there’s no baby Albert to be seen, which puts it back before 1912. He was born in the April, and my great-grandmother’s belt seems too tight around her waist for someone who is pregnant (although that said, there were maternity corsets, which were seen as being helpful for supporting the child’s weight). Winnie is clearly a toddler in the first photo, and Lily looks somewhere around five or six, so this puts the photo to around 1910-1911, I would think. Unfortunately, I don’t know who the other little girl is, but she must be a cousin of my grandad and my great-aunts.4)Identifying the sitters is a subject for another time. Perhaps considering who isn’t in the photo might help. My grandad’s cousin Frederick George Henry Tubb (1884-1977) doesn’t feature, and he emigrated to New Zealand in 1909; I don’t think he ever came back to the UK. Why was the photo taken? This isn’t a casual snap, but the record of a family gathering (which makes me wonder who the one person involved in this photo is, who I cannot identify, and probably never will, for the simple reason that I cannot see their face as they’re behind the camera) – I scanned in the photo at 300dpi and could see a huge amount of detail. 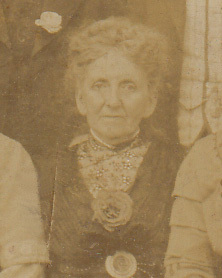 You can see in the individual photo of Elizabeth Shrimpton (above) that she’s got a rose pinned to her bodice, and if you look closely, you’ll see that everyone in the photograph has a rose somewhere about their person – except for Winnie, who, as a toddler, was clearly just at the age to be kept away from things that feature thorns. The men all wear their flowers in their buttonholes, but the women have theirs tucked inside their belts – which possibly wasn’t too comfortable and so maybe was only worn for the photo. And it’s not just roses that signal they were celebrating, nor the fact that they seem to be wearing their best clothes. 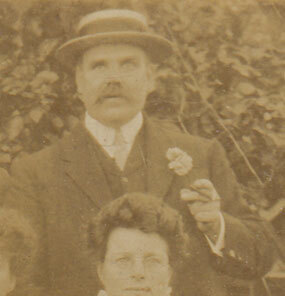 Zooming in on my great-grandfather, I realised he was smoking a cigar. John “Harry” Nunn enjoys a smoke. And he’s not alone – the man at far right on the back row is also enjoying a “Lah-di-Dah”. 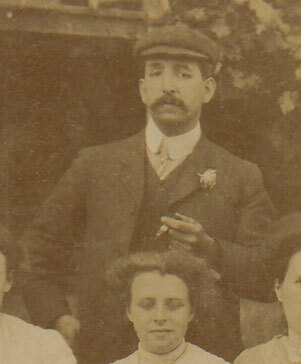 With his straw boater, however, he seems to be more the sort of chap who would routinely partake of a Cuban. John’s flat cap and no-nonsense, insouciant hand-on-hip pose (a pose so beloved of men in these old photos) looks more like a roll-your-own man. So what, exactly, would this family be celebrating in about 1910? Well, we need to come back to Elizabeth Shrimpton, and the clue in the first paragraph when I introduced her – on 6th December 1910, she had her 70th birthday. I would think it’s very likely that this photo commemorates a family-get-together to celebrate Elizabeth’s birthday. It looks like there’s ivy in the background, which is an evergreen, so would still be around in December. Had this been a wedding photo, we would expect to see the happy couple in the centre; if it was a baptism, we would expect to see the baby and its parents. But it’s Elizabeth who’s in the middle, which implies that the celebration was hers. There are obviously things I’m yet to solve – such as identifying the sitters, but hopefully, if you’re reading this and are a descendant of Elizabeth Shrimpton, you might be looking at this photo thinking “Hang on, I’ve seen this before in an old biscuit tin, and my great-grandparents are in the photo!” If these words are currently traversing your mind, please contact me, long-lost cousin. And there’s something else that I’m not too sure about… a mystery object. When I zoomed in on the photo (partly to see what clues I could find, but also so that I could tidy up the fingerprints that were all over it! ), I noticed something odd on the wrist of one of the women. It could just be a wristwatch – they were worn by women from the late nineteenth century, but it looks quite large. It’s almost as if she slipped out of the photo into a time-machine, ended up in the 1980s and bought herself a Swatch, and got back in her seat just before the shutter clicked.5)An unlikely scenario, but one I am loathe to put aside, just because it would be fun. Or is it something else? A bracelet? I wondered if it could have been a bracelet containing something – a cameo, or maybe it’s mourning jewellery and contains the coiled hair of a loved one? Elizabeth’s only son, John, died in 1909, so it’s possible. But… at the moment, I don’t know. 1. ↑ Dorothy was remembering something that happened to her as a toddler, which might make people scoff, but I have oddly vivid memories from that age myself – snapshots of being at playgroup before I started school, and of my brother’s birth when I was three. 2. 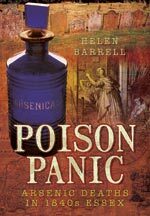 ↑ He’s an older man, and it’s tempting to say that he’s Elizabeth’s husband – however, her second husband died in 1890. He is likely to be the husband of one of Elizabeth’s daughters, who are to be found sitting in the middle row, or he could be a father-in-law – perhaps the father of one of the other men in the back row, and a contemporary of Elizabeth’s. 3. ↑ Her first name was actually Doris, although I always knew her as Auntie Lily. It was only when I visited the family grave in Southend that I saw “Doris L. Smith” on the stone, and realised that I had never known her real name while she was alive. 4. ↑ Identifying the sitters is a subject for another time. 5. ↑ An unlikely scenario, but one I am loathe to put aside, just because it would be fun.